Special Flood Hazard Areas represent the area subject to inundation by 1-percent-annual chance flood. Structures located within the SFHA have a 26-percent chance of flooding during the life of a standard 30-year mortgage. Federal floodplain management regulations and mandatory flood insurance purchase requirements apply in these FEMA flood zones. Coastal High Hazard Areas (CHHA) represent the area subject to inundation by 1-percent-annual chance flood, extending from offshore to the inland limit of a primary front al dune along an open coast and any other area subject to high velocity wave action from storms or seismic sources. Structures located within the CHHA have a 26-percent chance of flooding during the life of a standard 30-year mortgage. 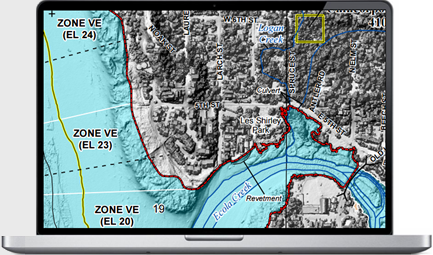 Federal floodplain management regulations and mandatory purchase requirements apply in these FEMA flood zones. Areas of moderate or minimal hazard are studied based upon the principal source of flood in the area. However, buildings in these zones could be flooded by severe, concentrated rainfall coupled with inadequate local drainage systems. Local stormwater drainage systems are not normally considered in a community’s flood insurance study. The failure of a local drainage system can create areas of high flood risk within these zones. Flood insurance is available in participating communities, but is not required by regulation in these zones. Nearly 25-percent of all flood claims filed are for structures located within these FEMA flood zones. Are you in a Flood Zone? See a home on the newest FEMA Flood Map. It’s easy to order your own detailed Report. If this comprehensive Flood Zone Report reveals the structures outside the FEMA high-risk flood zone, the homeowner can use the information to dispute the mandatory flood insurance requirement. Simply forward the information to the lender or insurance company. Experienced FEMA Map Analysts & Certified Floodplain Managers available. Background in the NFIP and lender compliance. Flood Vendor services available to the public outside of contacts. Executive Member of the National Flood Determination Association (NFDA). New and Preliminary FEMA Flood Map Research. An Elevation Certificate details a structure’s elevation. This certificate verifies the elevation of the lowest floor of a house relative to the ground. It’s especially important if your house/building is in a FEMA high-risk flood zone. If you find that the Lowest Adjacent Grade (LAG) of the structure is above the FEMA Base Flood Elevation (BFE), a Letter of Map Amendment (LOMA) of removal is possible. This will drop the mandatory flood insurance requirement, and if the homeowner decides to have flood insurance, it’s available at a heavily reduced price. If you are looking for an elevation certificate, check with your local government for any elevation information or certificate on file. You may have one in your closing documents. If not, check with the local building department to see if there is one in your permit file or contact the builder that sold the property. If nothing is available, you must contract a state-licensed surveyor to complete the Elevation Certificate. The price of an elevation certificate varies greatly by state. We recommend calling around to find an average price in the area…hopefully, the homeowner can find a good deal. What should I do if I have an Elevation Certificate? You can email us a copy for a Free Elevation Certificate Review. We will study the elevations and discuss your options. 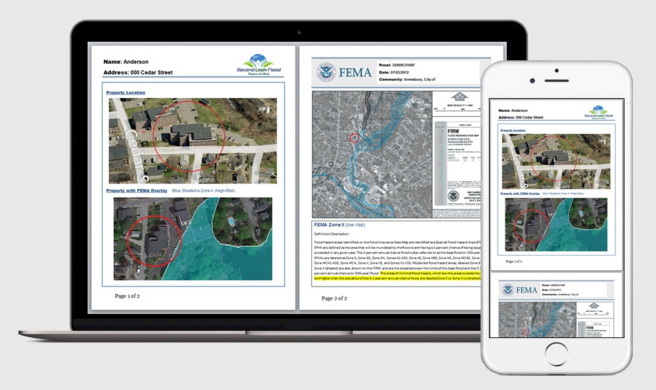 Save time and money by working with an experienced FEMA Map Specialist. Does an Elevation Certificate expire? No- even an older elevation certificate has valuable information. While the FEMA Base Flood Elevation (BFE), showing the high-risk flood zone, may change over time, the Lowest Adjacent Grade (LAG) of the house/structure does not change. We can still compare the LAG to the current FEMA BFE.